I love kicking around Detroit, especially with a good companion, but the places I want to go are fairly crowded on the weekends, so to my delight my son was around on a Thursday, and we headed downtown for a look around. I took my usual route from the western suburbs, Michigan Avenue. It appeals to my blue collar roots. The route was used by generations of workers headed to the Ford Rouge complex and to the plants near Ypsilanti. It was also used by baseball fans headed to the old Tiger Stadium. I actually remember when it was Briggs Stadium. I'm a Detroit native, and the route brings back memories of when it was a major artery and business district, especially for the Polish. There's still a Polish veteran's hall off Michigan. Detroit people may move, but they don't give up their landmarks easily. Our first stop was the Detroit Institute of Arts, where there was a photo exhibit, Detroit Revealed, which was interesting in a visual way, but I felt it was missing something. The photos of street scenes and faces were art prints. As I walked through the exhibit, I realized what was missing -- the workers, the voices of those who put on bumpers at Fords or built boxcars, as I had done in college. 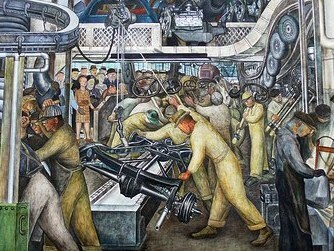 I fled and sought refuge in the room with the Diego Rivera murals, which date to the early 1930s, and show life in the factory the way it really feels. Here were the voices of the workers; their faces grim, their arms muscled from the work. These were guys I could relate to. The murals weren't without controversy when they were unveiled. Folks on the left didn't think they went far enough in showing the toil of workers, and those on the right thought they depicted too much. When that happens, the artist is right on. The right wingers almost got their way, and the murals were almost painted over, but Henry Ford's son, Edsel, came to the rescue and they survived. I've been a fan of the murals since I was in college at nearby Wayne State, and use to sit in the room and read. These days I'm working on a historical novel set in Detroit in the early 1930s, an era beset by labor troubles, and the murals give me a glimpse into what factory life was like during that era. After out tour, we went to Slows Barbecue on Michigan Avenue for lunch. It was about 2 p.m., and we got a table right away, a treat since weekend waits to get into the place can be up to an hour. Much of the block where the restaurant is located has been rehabbed, and there's news that the old Mercury bar across the street will be turned into a coffee shop. I thought about the recent news from Wayne County about how a new appointee to Metro Airport was given a sweet heart contract for $200,000 and an expensive package from the county because she quit her job to take the new one. I wondered what developers could do with just a few hundred thousand dollars to redevelop the area around Slows. It makes me sick to think that government in Wayne County and Detroit is wasting so much money on cronyism and corruption, when there are so many projects in need of help. After lunch, we casually walked across Michigan, something you couldn't do 20 or 30 years ago because of the traffic. I just hope that some day that traffic returns. We owe that to the workers who helped build this city.